Happy Saturday everyone! 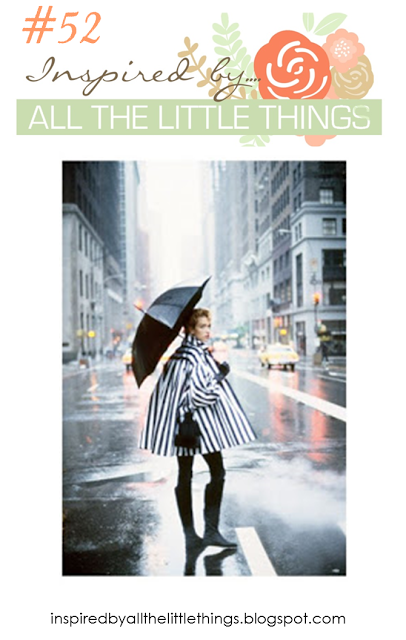 Check out the new inspiration photo going on at Inspired By All The Little Things! My inspiration came from all the books on display with their rainbow colored book spines. I've always loved to read but have to admit, I'm now using spare time to stamp rather than read. I always look forward to vacation when I can get a couple of novels read for a change. 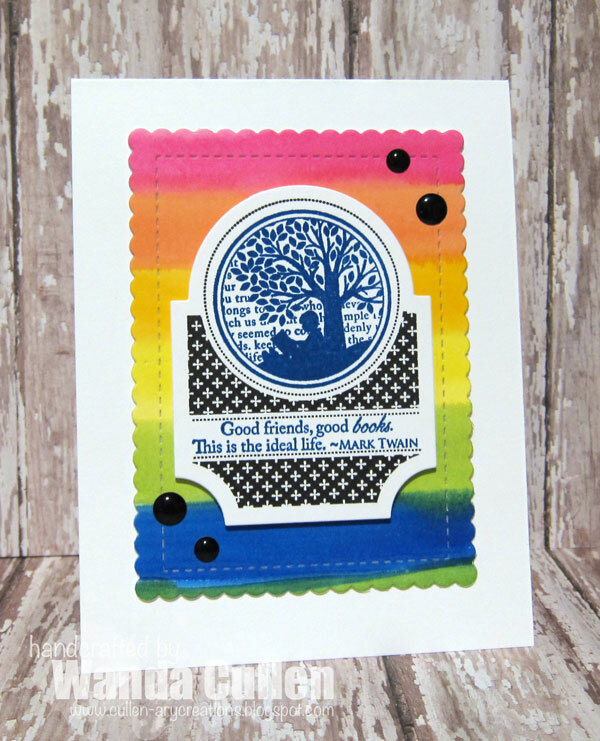 I dug out an old stamp set - All Booked Up by Papertrey Ink - and popped up the die cut over a rainbow of watercolored stripes. I love the vibrant colors in Mijello Mission Gold paints! 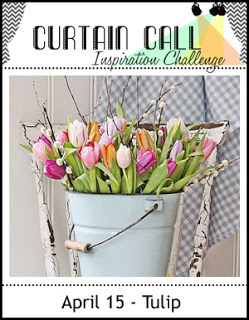 We'd love to see how you are inspired by this challenge photo, so hope to see you in the gallery! Looks like a hot weekend in store for us here in VA at the end of this yoyo weather week. Enjoy your weekend...wherever you are! STAMPS: All Booked Up (PTI). 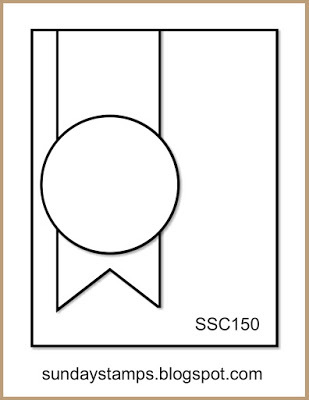 PAPER: Ranger Distress Watercolr Cardstock; White (PTI). INK: Pacific Point (SU); Versafine Onyx Black. DIES: Mix & Mat: Scallops Die by PTI; Mat Stack 3 by PTI. 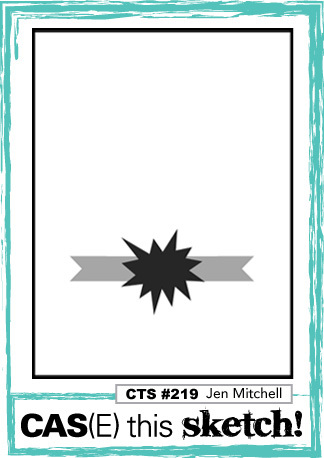 The week is flying on by and I'm making a quick post with a quick and easy card for the new CAS(E) This Sketch challenge. 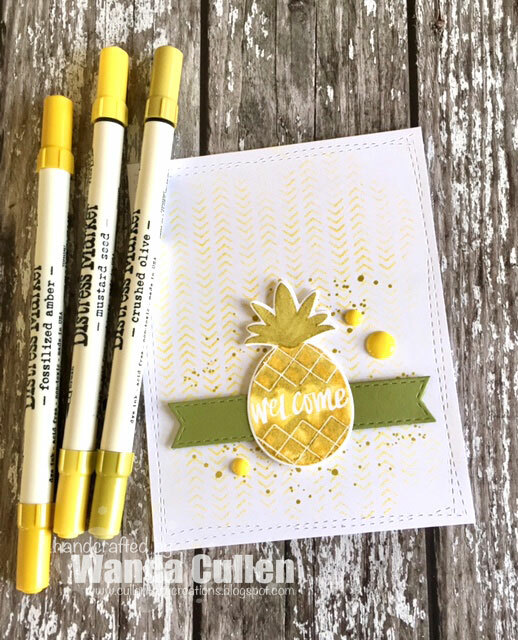 I thought I'd feature this fun pineapple image from Reverse Confetti's Pineapples A'Plenty set. 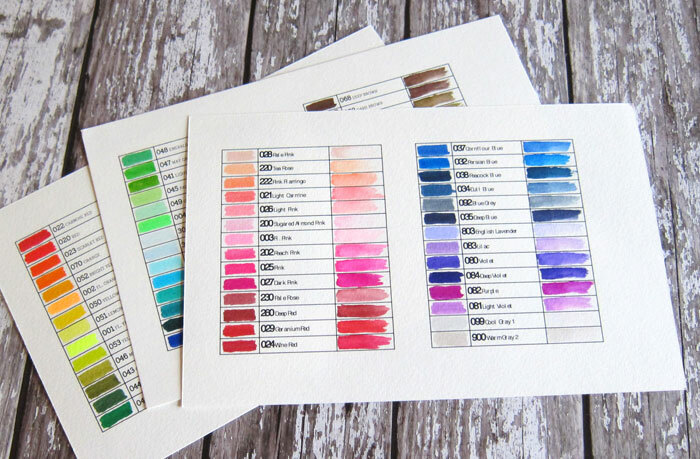 I applied 3 different colors of distress inks (using the markers shown in the photo) directly to the stamp, huffed on it then stamped on watercolor cardstock. I thought this gave a more natural look to the image. The background was stenciled with Reverse Confetti's Pointed Out stencil using Squeezed Lemonade and Mustard Seed distress ink then splattered with some Crushed Olive ink. The wonky stitched rectangle base is a die by Lil' Inker Designs and the Stitched Fishtail Flags Die-Namics die is by My Favorite Things. 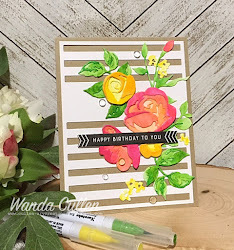 I created this baby card using the sketch by Sandy for the current Paper Players Challenge and I also am playing along with the Tag, You're It Challenge. PAPER: True Love 6x6 pad; Flamingo (RC); White (PTI); X-Press It Blending Pad. INK: Memento Tuxedo Black; Versamark; Silver Lining (WPlus9). 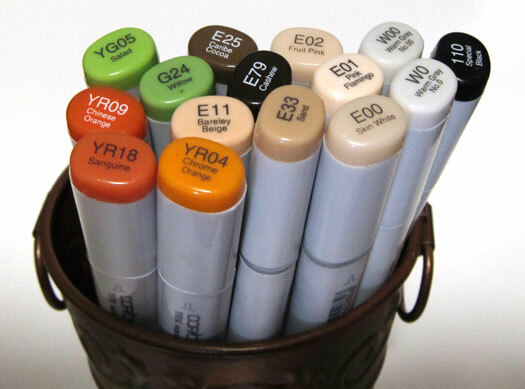 COPICS: RV10, R20 (ears); R85, R43 (flower); C1, C3, C5, C7 (bear). 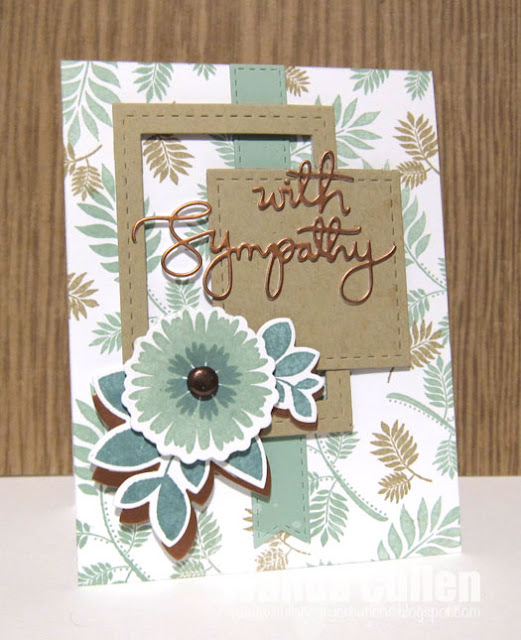 The sentiment was white embossed using my favorite Detail White by Stampendous. Some silver cording and metal dots finished it off. Hi everyone! 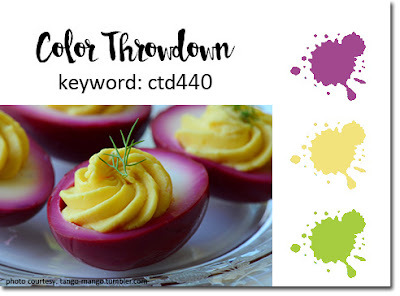 I'm the hostess for this week's Color Throwdown Challenge and was inspired with the colors - magenta, yellow and spring green - in this photo of one of my family's favorite side dishes! Here is my take on the color palette. cards from my two brothers! I watched Jennifer McGuire's three Zig videos on You Tube and also went with her method of storage, color coding the marker ends and making a color chart (you can see a photo of the charts on my Mojo Monday post two days ago). These brush pens make it easy to watercolor in smaller spaces. watercolored everything before die cutting. I've been waiting for some time for PTI to restock their stitched scalloped rectangle die and finally got it in the mail last week. 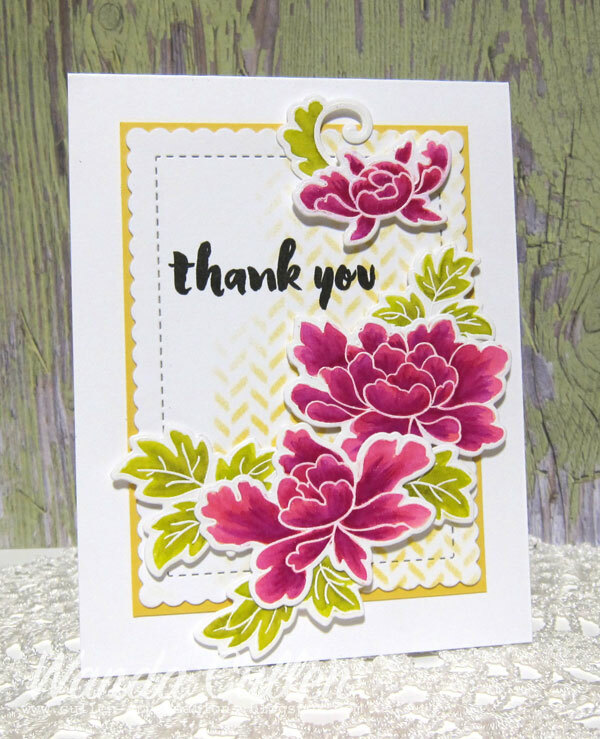 I sponged Daffodil Delight ink over Tim Holtz' mini stencil from Set 13. The florals are all popped up with foam dots. STAMPS: Peony Scrolls, Painted Greetings - Altenew. 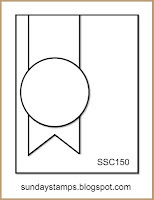 DIES: Peony Scrolls (Altenew); Mix and Mat: Scallops Die (PTI). 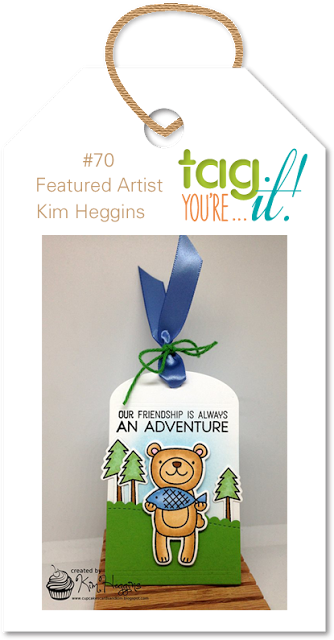 Our guest star stamper this week is Rosemary Dennis of Hey There... rosigrl! Congratulations! 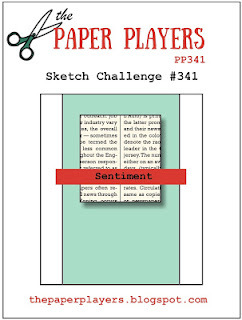 I couldn't resist another post in the same day...this time for Papertrey Ink's April blog hop. 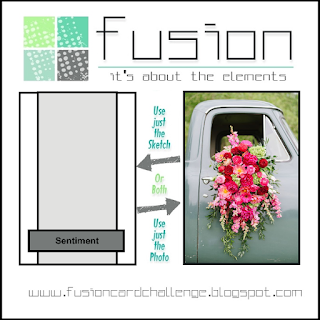 The inspiration photo has some beautiful colors that we are to use in our creations! 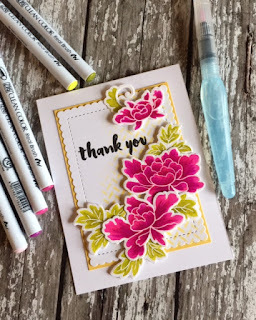 I used distress inks to stamp the florals and also the bokeh background with my homemade "ghetto" stencil with varying sizes of circles. 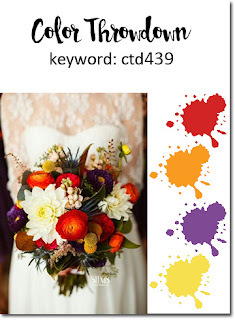 STAMPS: Beautiful Berries: Spring (PTI); Wet Paint (PTI). INK: Squeezed Lemonade, Mustard Seed, Pumice Stone, Spun Sugar, Ripe Marmalade distress inks; Silver Lining by WPlus9 for the sentiment. DIES: Tag Sale: Quilted Die by PTI; Wet Paint by PTI; Beautiful Berries: Spring by PTI. I'm fortunate to be off work again today and my plans to work outdoors got thwarted once again with the constant rain. No problem here! 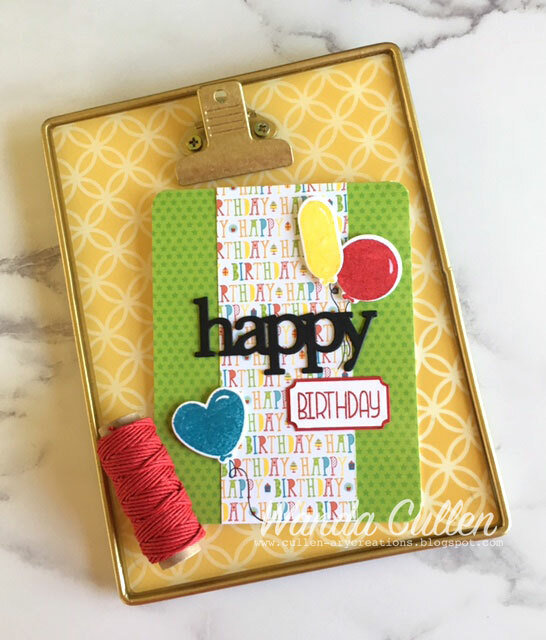 It gives me an excuse to create in my stamp room, so I joined in the fun on Nichole Heady's blog for the Make It Monday Challenge! 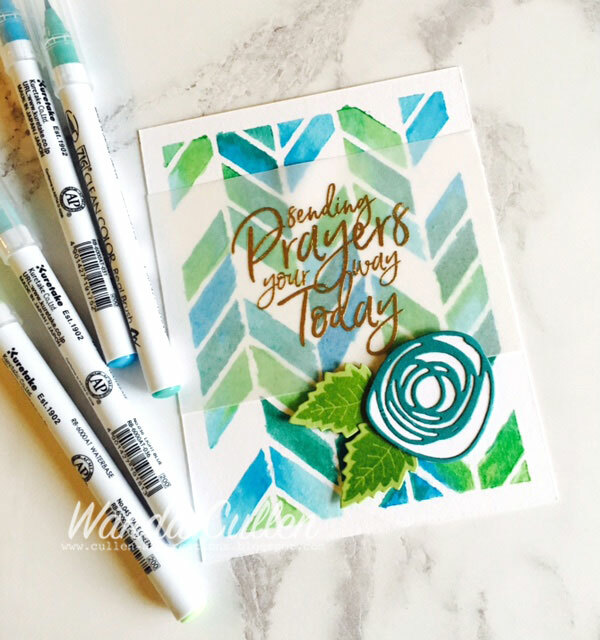 Betsy Veldman has a video to create stenciled watercolor backgrounds and it's easier than you think. I feel like I cheated by using my Zig Clean Color brush pens yet it uses the same process with the exception of "loading" my brush. :-) After taping down a 4 1/4" x 5 1/2" panel of Tim Holtz distress watercolor cardstock topped off with a Simon Says Stamp's Chevron Pattern stencil, it was watercoloring time. I chose four Zig brush pens: Pale Green, Light Blue, Cobalt Blue and Turquoise Green. I gold embossed a sentiment (love that font!) from PTI's newly released Pen and Ink set on heavy weight vellum. 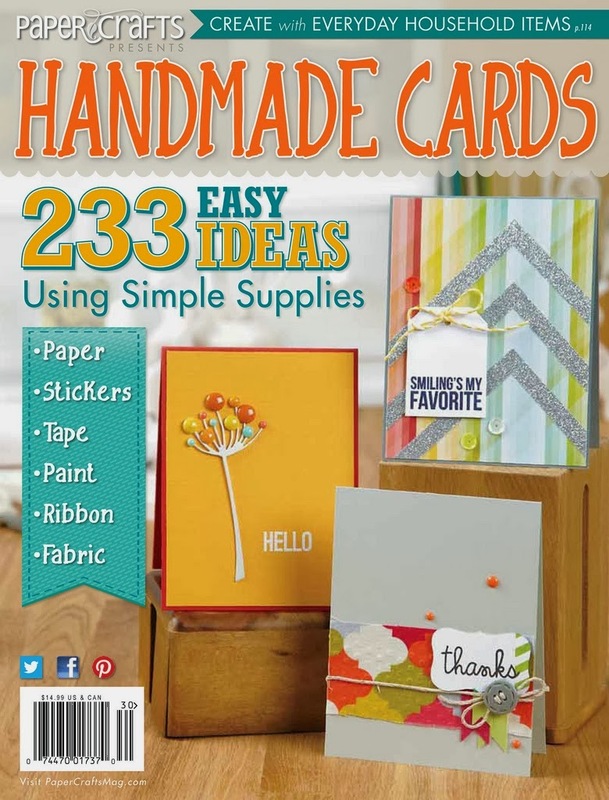 I adhered it to the card base using a light spray of Elmer's Craft Bond spray adhesive. 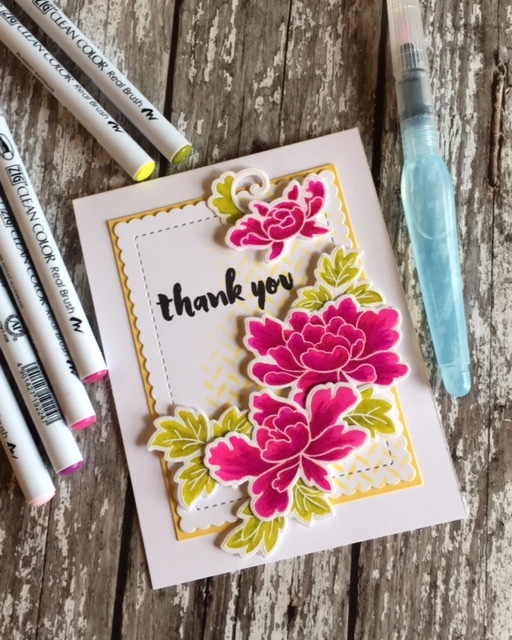 I embellished with a circle scribble die and a couple of leaves from PTI's Delightful Dahlia Additions stamp set with matching die. 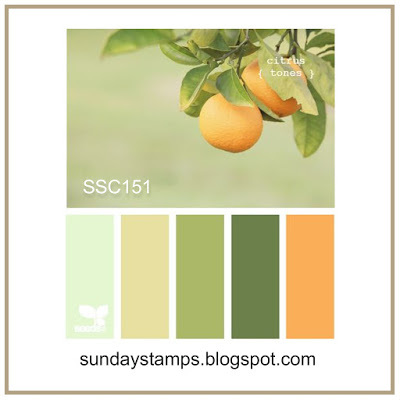 After a full day of nothing but rain, I was happy to join in with the Sunday Stamps Challenge to bring in some sunshiny colors to my stamp room! 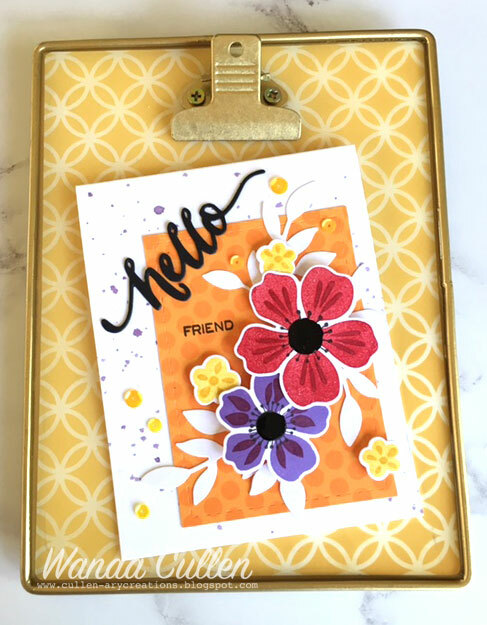 I played with some new toys - my Zig Clean Color Real Brush Pens and the Cutaway Tags: Spring stamp set and matching die by Papertrey Ink. I'm also joining in the CAS(E) This Sketch challenge by using their great layout. I thought the colors would pop more if I "lined" the die with black paper. There seems to be a never ending demand for birthday cards this time of year, so once again, I chose a sentiment for that reason. 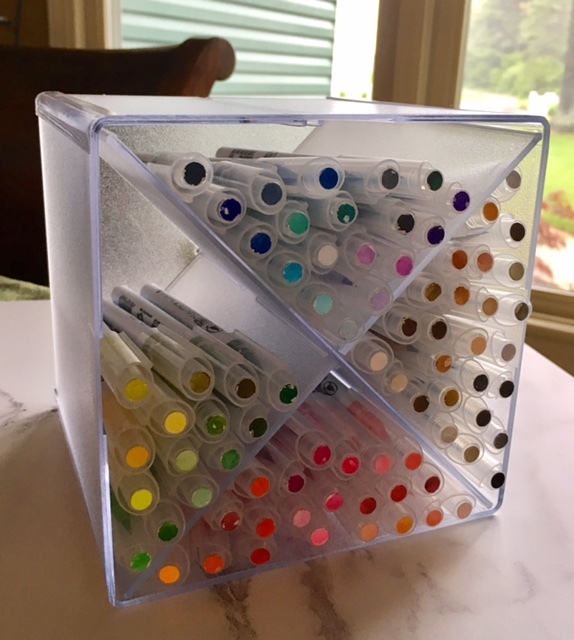 I took the time to print off the color charts posted by Jennifer McGuire (they are in the link on her video post HERE). 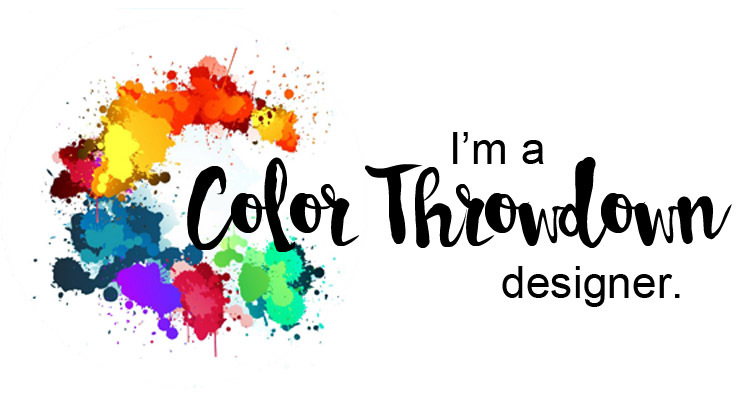 They are a huge help when going to choose Zig colors for a project! STAMPS: Forever In Our Hearts and Bloom and Grow - both by Verve. PAPER: White, Crumb Cake, Mint Macaron, Copper metallic CS by SU. 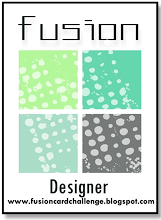 INK: Mint Macaron, Crumb Cake, Lost Lagoon - SU. 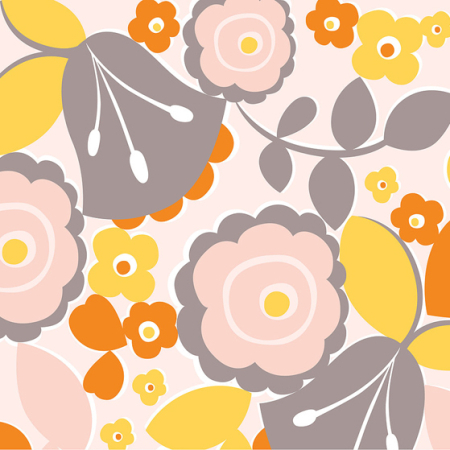 DIES: Stitched Rectangle and Square by Lil' Inker Designs; Stitched Fishtail Flags Die-Namics by MFT; Floral Circles and Elegant Leaves by Verve; With Sympathy by Simon Says Stamp. Hello weekend and hello to a new Inspired By All The Little Things challenge! 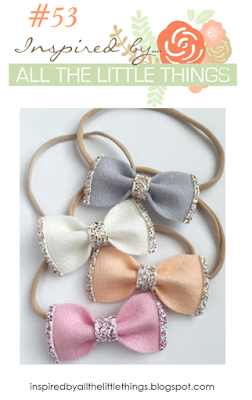 Check out this fun inspiration photo which led me to focus on the peachy/pink colors and the silver glitter details. 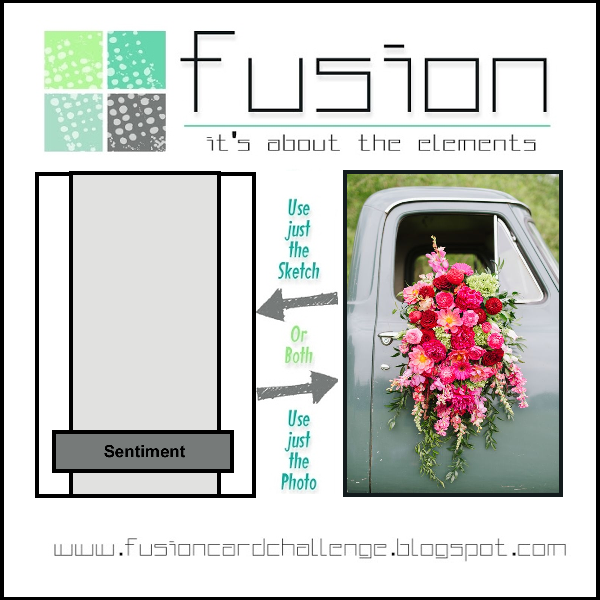 I also created my card for the tulip themed Curtain Call Inspiration Challenge and the sketch is for the Fusion Card Challenge! I went deep into my archives of old SU stamp sets for this two step tulip set and paired it with Reverse Confetti's Beautiful Banners set and matching die. STAMPS: Terrific Tulips (SU); Beautiful Banners (Reverse Confetti). 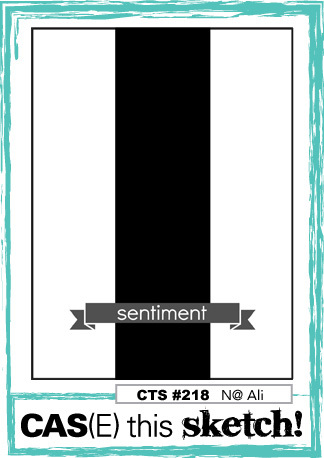 INK: Little Piggy, Flamingo, Beanstalk, Last Leaf by WPlus9; Versafine Onyx Black. 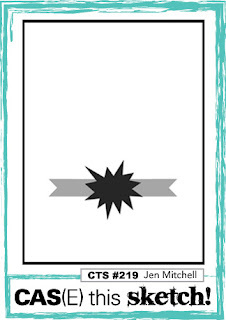 The silver glitter cardstock was perfect for an elegant border that mimics the borders on the bows. We're happy to have Marie Peters guesting with us. Here's hoping to see you in the gallery! I needed a quick birthday card for my middle son who is celebrating his 31st tomorrow! 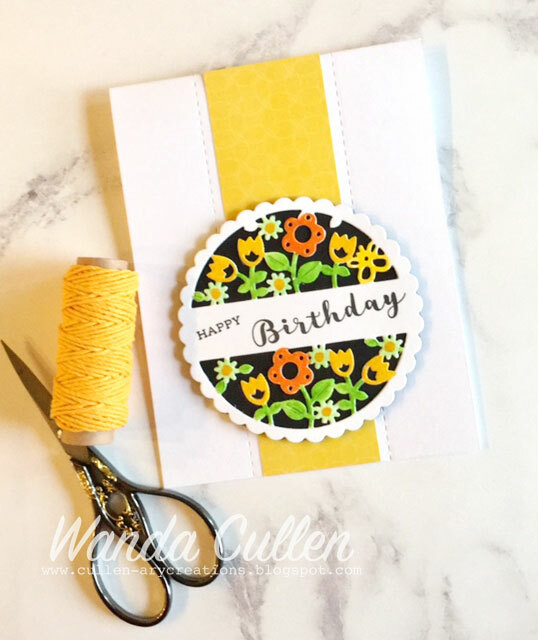 My 'go to' set for masculine birthdays is WPlus9's Whole Lotta' Happy stamp set and coordinating dies, so I paired it up with the sketch for the new Freshly Made Sketches challenge. STAMPS: Whole Lotta Happy (WPlus9). PAPER: Surprize! Collection by BoBunny; True Black (PTI), Real Red (SU). INK: Real Red, Daffodil Delight, Pacific Point - SU. The balloons are popped up with foam tape and hand drawn 'strings' were added with a Copic multiliner pen. 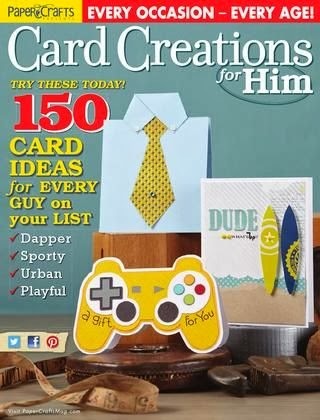 I used a corner chomper to soften up the card a bit. Thanks so much for stopping by and commenting! Have a great Thursday! I splattered some Dusty Concord distress ink on the card base then layered patterned paper from Doodlebug Designs' "Sunkissed" 6x6 pad. The leaves were cut using SU's Sizzlets Little Leaves die. The florals - MFT Flashy Florals - were stamped, die cut with coordinating Flashy Florals Die-Namics then popped with foam tape. The sentiment die and stamp are from WPlus9's Hand Lettered Hello set. It's hard to see the shine in the photo, but I added Black Enamel Accents to the flower centers. INK: Grape Soda (Reverse Confetti); Real Red, Cherry Cobbler, Daffodil Delight, Crushed Curry, Rich Razzleberry - all by SU; Versafine Onyx Black. 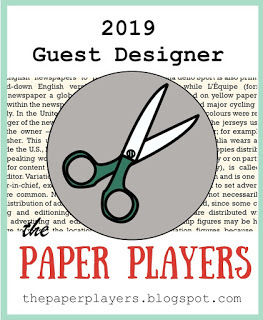 Want to give a warm welcome to Pat Gotsis, our guest star stamper this week! 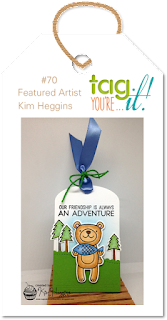 Be sure to visit her Merely Creating blog and say hello! Good Monday everyone! 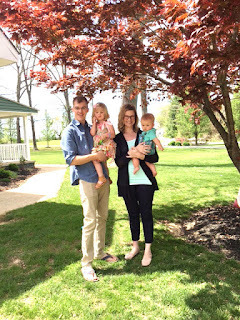 I trust everyone had a blessed Easter! 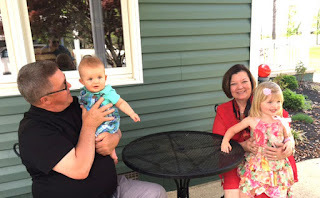 I know it was a VERY busy weekend at my place, but it was so worth it to have a tasty meal and fun times with the grands in the afternoon! Julee's sketch for the new Mojo Monday Challenge had so many possibilities for this great layout, but I refrained from creating with flowers and went with a nautical Father's Day card instead. I started out with papers from Carta Bella's Beach Boardwalk 6x6 pad. I added a sailor's knot using cording and paper pieced the sailboat after deciding the card was just too bleh without it. A few dew drop embellishments finished it off. STAMPS: Strong Anchor and Learning to Sail - both by Verve. INK: Night of Navy (SU); Memento Tuxedo Black. The egg hunt is on! 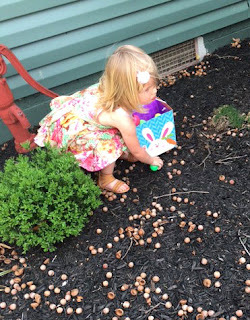 Looks like acorns need to be cleared out of my flower bed! Nana and Pawpaw posing with Quinn (age 2 1/2) and Cash (age 8 1/2 months). Happy Easter everyone! I'm looking forward to being off work and spending time with family and, of course, some cooking will be involved! I'm hoping to sneak in some stamping time as well. There's a great new inspiration photo for the Inspired By All The Little Things challenge! 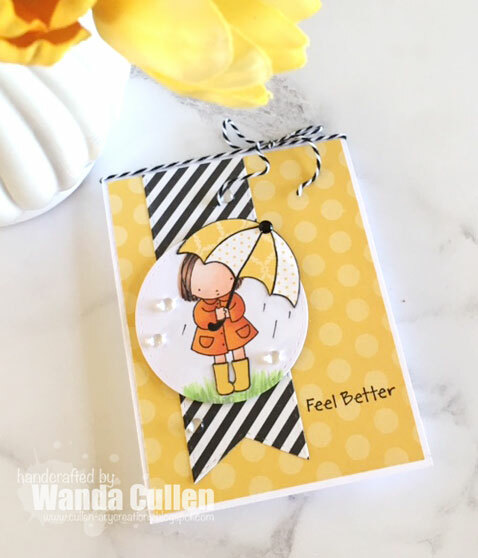 I was inspired to use a rainy day/umbrella theme along with black and white striped paper with a pop of yellow (inspired by the yellow taxi and the street lamp lighting). 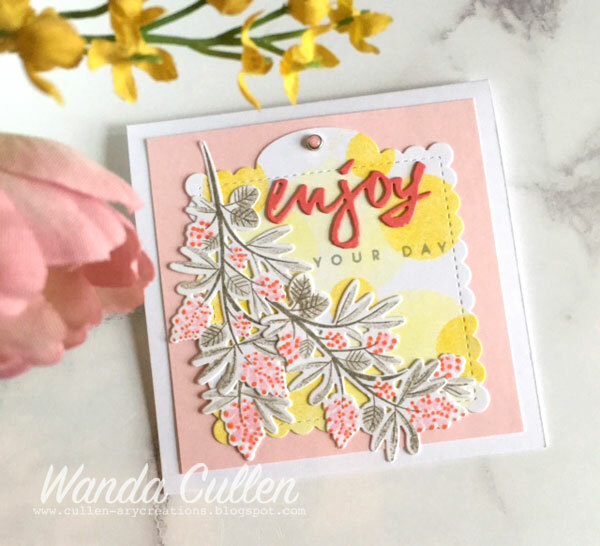 To add an element of shine to my card, I added clear dew drop embellishments. by MFT and colored with Copics. I added a bit of paper piecing to the boots and umbrella. Papers are from Authentique's Classique: Beauty 6x6 pad. 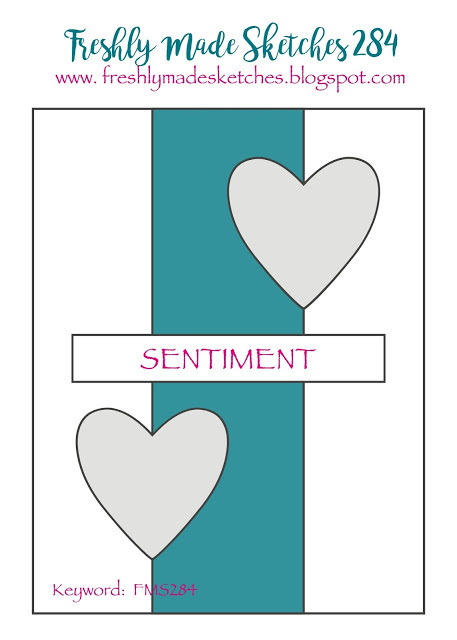 The layout is based on the sketch for the Sunday Stamps Challenge. 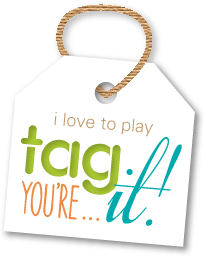 Here's hoping you'll join us in the challenge! Would love to see what you create!